Native to the Near East and Central Asia but has long been cultivated in the Mediterranean region and more recently in the Southern US. The kernels are green and are prized as much for their ornamental colour as for their flavour. Also sold roasted and salted in their shells. They are more expensive than most other nuts. 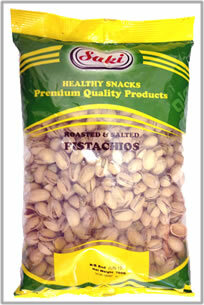 100g pistachios contain 19.3g protein, 14mg iron, 140mg calcium.